FYI, it looks like they are showing encore presentations (reruns) of the Wednesday episodes of Veronica Mars on Sundays at 7 PM. Once again, Yahoo is having a killer deal with domain name registration. Only $2.99 a year and they let you register for up to five years! Get your name, your kid’s name or business name before someone snatches it up. Usually it’s $9.95 but quite often you can get it on special for $4.95. Usually cheap prices like this only let you do a year at a time. And you don’t have to use Yahoo for anything else, most web servers let you host your domain name anywhere. Back in the old days of the ‘net, it was $50 a year (I’m not kidding). So I saw Flight Plan yesterday. I enjoyed it, I definitely wouldn’t have enjoyed the flight. Think Die Hard / Passenger 57 with Jodie Foster as the ultra smart airplane engineer (who has to consider the ideafact that she might be a little crazy) but there is no visible enemy. How do you fight back? So you’re on a plane and have a hysterical mother who’s missing her child during a flight. What do you do? Even if you don’t believe her, what do you do? Lots of screaming and calming down. The movie made a lot of people look suspicious though, it made it hard to pay attention at first. Very cool plane, a LCD TV in every seat, it was bugging me that I couldn’t figure out how the trays came out (but yet didn’t still block the screen). The soundtrack was very mellow, I expected different from James Horner for this type of movie, please note I didn’t say bad or disappointing, I just thought it’d be a little more ala Brainstorm. I enjoyed it, it was pretty much what I expected. A few (maybe more than a few) loopholes but it’s a movie and I can can live with that. Most of the reviews I’ve read didn’t seem to like it, but as I said, I enjoyed it. “It” was using special software like Movable Type to run a web log. Why would I every want to do that? So I was playing with the language translators on-line. I was trying to do a full conversion of my page to french and then back again so you could view the whole thing, but I had technical difficulties. So here’s the original paragraph and next to it that same paragraph converted to french and back to english. The third column is that translation from to spanish and back again. The “sleep” paragraph is from a few posts back. It was short and seemed like a good choice. What is this blogging thing all about?!? John Dvorak does an article called “Dvorak’s Blogging Primer” in the October 18, 2005 issue of PC Magazine. It’s just over two pages and it’s not bad. He breaks it down pretty concisely and does a huge sidebar (2/3 of the page) called “Anatomy of a Blog”. It’s interesting so check it out or I can send you a free digital issue (see below). The article, which starts of page 60, also has some followups by others: One on RSS Feeds and another on creating podcasts. FYI on Zinio, some subscriptions are a lot cheaper, some aren’t it just depends. Sometimes you can find free subscriptions on-line. They have a variety of free samples if you poke around. A lot of free trade magazines too. It looks like they have a new feature with different free magazines from different ends of the globe. They’re starting to offer textbooks, I don’t think I’d like that. Here’s three free samples of the textbooks (genetics, psych and business) too. CNN has an interesting hurricane web page, you can go all the way back to Dennis of 2005 for information. The information for the current hurricanes is kept relatively up-to-date. My guess is that he’ll top out at 1/4 to 1/3 of a million (400,000 tops) at some point it’s gotta get visually unappaealing. Found by Amy at All About Me. UPDATE: So it looks like they are going to be just (and I do mean just) south of the hurricane’s path. Flooding warnings at the NOAA site. So I like maps and when I saw this in someone’s sidebar I felt the need to get one of my own. You can click the bottom to see additional local feeds. Today, at 5:23 PM, the Autumnal Equinox occurs (in the southern hemisphere the spring equinox occurs). This is the day when the sun rises exactly in the east and sets exactly in the west. This is when the northern hemisphere starts to get colder as “the Sun crosses over the Earth’s equator on its way south” (more info from Universe in Motion). See the diagram for the Winter solstice to illustrate what it’ll look like in a few months. I’ve also read that it starts at 14 minutes after the hour (instead of 23, but 23 seems to be most referred to). I’ve also gotten ready for the season by changing my blog look. It’s very similar to fall a few years ago, but I always liked the leaves. My thoughts go out to everyone who’s in this mess. The same for those worried about friends and family. Tuesday night, the sheriff (from Louisiana) wrote a check for $2.5 million out of the department’s bank account — which only had $23,000 in it — to reserve 150 trailers for his staff. I’m not sure how long NOAA will have this photo up (551k), but it’s amazing… They keep current events up for about 60 days, check out some of the archive. You get an iDisk which just mounts on your desktop like a hard drive, floppy or thumb drive. It has remote storage (off your computer) and will automatically sync when you are on the net (but you can use it even when you aren’t on the net). This is great if you have a laptop. If you lose/break it, you still have you files. These files are then accessible (via password) from most Windows and Macs that are on the Internet. If you have a second (or third computer) it’ll also sync to make sure all the computers have the same files. It does the same for you Bookmarks/Favorites, your Mail settings, your contacts and your calendar. Plus you can log in anywhere from the web to view this information! Plus they give you web space to very easily publish photos and movies (just click a button from iPhoto and iMovie). All sorts of other stuff! You can buy more storage space and additional mail accounts. They have some family plans (you get less storage for the four subaccounts) which cost less in the end. You can buy more storage or more e-mail. They are a little pricier but the ease of use is worth it. This is a really cool product, I can’t believed I’ve never mentioned it before. And the easy of use makes it even better. If you were geeky enough you could probably do the remote back up much cheaper, but the work involved and that it wouldn’t do all you other preferences and include virus and all the easy web published and tutorials (and more). I’m thinking the storage increase must be very new, a lot of the online ads don’t even reflect it yet. Some of these short little posts about the gas prices just aren’t going to make sense someday when someone looks back at these posts. These days I can just say “$2.38” to someone and it makes sense (they know I’m talking about the gas prices) but if it ever gets reasonable again it won’t be as clear. FYI, for gas prices I keep an eye on detroitgasprices.com (not more than 24 hours out of date), I don’t rush out when I see a great price but if I’m heading in the direction I’ll get it. It just gives me an idea of if it’s in the $2.40s or $2.70s today. Also, sites like this are more up-to-date when prices are very high (what ever constitutes high that year). GasBuddy.com is the parent site and lists all over the country. Chapter Titles From My Creationist Textbook. Check out Chapter Titles From My Creationist Textbook at McSweeney’s. Klingon Fairy Tales and Things Hagrid Would Say If He Served Jesus Instead of Harry Potter are pretty funny too. So Buy.com is selling books at 10% less than Amazon with free shipping. Plus they are giving you $30 off if you sign up for their charge card. So I picked up a few of the books om my Amazon wish list. I wasn’t thinking about it at all when they came in today so I’ll have a few more reviews in the (near?) future. One of them I’m not sure if I actually have it already, I’ll have to check when I get home. Speaking of Amazon , I had a second (and third surprise). I got some sheets I ordered a few weeks back and a shirt that I have no idea when I ordered it (both were way on sale). I never order clothes by mail but the shirt was a deal (maybe I ordered it with the sheets? ), we’ll see how that works out. More info on the Birthday…. I never really gave any followup on the birthday, even after all the great comments, here’s a little more info: So last weekend a group of us went to play WhirlyBall, picture a playing catch with a whiffle ball and scoops, but you’re shooting for a target at the end of the court and you’re driving bumper cars (no, I’m not kidding). It’s hysterical, we had a blast, friends, relatives and people I work (and worked) with. They have a bar there and we had pizzia, munchies and (of course) cake. I’ll be mentioning books and music and other things as I read and listen to them. I really need to get a better digital camera for low light (FYI, that’s my Mom in front), maybe I’ll consolidate some of my gift cards and take the plunge. We should have done a posed picture out on the court. My weblog owns 31.25 % of me. 1) The hotel I’m at has the slowest Internet connection I’ve ever seen or had. But at least it’s free. 2) My web sites are down, so I don’t know when this will actually get posted. What’s Inside an iPod Nano ?!? So on Systm (actually it was SubSystm, a short show focusing on one topic) they just felt the need to crack open the beautiful iPod nano. They filmed it live so you get to see all the guts inside (here’s the specific episode). Besides a little bit of an iPod infomercial, the show included a putty knife, a screwdriver and some really dangerously thin ribbon cables that he was afraid to break remove. It looks to me like it’ll be easy to replace the battery in the future. It also looks like (assuming the hardware will support it) that it might be easy to replace the memory chips with something larger in the (far) future. Even if it won’t supoort it, they’ll adapt it, everything else is done (you can’t make it much smaller with a screen and a clickwheel), it’s just getting the size of the memory down (a 60GB nano would be nice someday). Thanks for all the nice comments about my birthday. They were all really great! Today’s the actually day and we’re just about run out to dinner, so I’ll give a little more of a run down tonight or tomorrow. Thanks again! 1] Would you accept $1,000,000 to leave your country and never step foot in it again? Why/why not? If I could get a waiver to come back for when my Mom needs me (older/sick/etc. ), I’d take the deal! Where do I sign?!? I like it here, but to retire and go live somewhere and the only work I’d have to do is stuff I’d like and live off the rest, I’m already packing the bags and booking my flight to Costa Rica (or wherever). 2] If your friends and acquaintances were willing to bluntly and honestly tell you what they really thought of you, would you want them to? Why/why not? Do you feel that your friends and family members *already* are pretty honest with you? 3] You notice a severe, self-destructive behavior pattern in a friend who is clearly unaware of it. Would you point it out? Why/why not? Heck yeah! Why? Because it’s self-desructive, that’s why. 4] If you could script the basic plot for the dream you will have tonight, what would the story be? Sorry, I try to keep this blog rated G (or even PG). 5] How often do you step back and reflect upon the way you are living and where you are headed? Do you often set goals for yourself? Why/why not? Yeah, but they haven’t been being met lately. Most of them revolve around dating or children so some of it’s a little out of my control… But I’m back into looking into adopting again. A co-worker just did it and seems happy with the organization she worked with. I’m actually doing a Friday Meme on Friday, what are the odds of that?!? So I found this cool meme and the object is to make a list of 101 goals and get them done in 1001 days. I’m going to put something together and see how far I get. This ties in with today’s Friday Forum (goals and reflections) and 9/11 (no, not that 9/11, the other one). Actually, I didn’t find it Sarah did. So I know all it seems like is that I’m talking about these days is phones, music, iPods and cable bills lately, but I’ve been really geeked about the new Apple “toys” and I always like reducing costs on recurring charges (like phones, cell phones and cable). Saving $10-15 a month each on your phone, cell and cable, while avoiding any overages could be $500 year. That’s not being cheap, it’s avoiding being wasteful. If you don’t care about saving money this’ll be a boring post so just skip it. I also just made the leap to ditch my POTS land line, so I really wanted to make sure I’m not going to get nailed for overages. At $40+ a month with taxes, that with my other savings is another month’s mortgage payment. FYI, if you can make an extra mortgage payment a year it shaves about 7 years off your total mortgage. With Sprint, changing your plan means generally (99% of the time, especially if lowering your plan) means redoing a 2 year contract. I had 6 months left so I really only ended up tacking on 18 more months. Plus, they gave me $150 to spend towards a new phone if I want it since I renewed the contract (for my mother’s line they only offered me $75 towards a new phone). They also offer 6 o’clock nights so if you do a lot of you calling starting then you can add that to save some minutes (if you have a 9pm nights plan it’s $5 for 7pm and $10 for 6pm to start unlimited calling). If you’ve been with them for a bit you can usually get them to waive the 7pm fee. A little haggling and you can get them to wave the $5 for mobile to mobile free calling and if you really have been with them for a while you can get a 5% courtesy discount, I know there are people with better plans than that, but I haven’t been able to do better. To get any of the “discounts” like these you have to ask several times and sometimes re-word it before they give you some of the options. I haven’t been able to get them to give me the 6pm nights for even $5, they want to throw away my $5 discount and charge me the whole $10, we’ll see how the plan works with the new stuff. They’ve also lowered altered the Vision data plans, it looks like if you don’t have a camera (or video-player) in your phone you can get the $10 plan ($5 for additional phones) instead of the $15 plan. Apple iTunes music store statistics: I’m listening to the keynote as I get stuff done here and I thought some of the numbers were huge enough to mention. They sell 1.8 million songs a day. They have 82% of the market share in the us, 85% of the market of the world wide music stores. They have 2,000,000 song vs. 200,000 from 2.5 years ago. And they have ten million accounts on iTunes. For podcasting, which they just added few months ago, they have over 15,000 feeds and 7,000,000 subscriptions. I wasn’t sure yesterday but the Harry Potter content is exclusive to iTunes and so is the selling of individual Madonna tracks. The iPod Nano has 2GB and 4GB models, color screen, click wheel, thin as a pencil (3.5 x 1.6 x 0.27 inches and 1.5 ounces) and I think it’s all solid state (no hard drive) so it doesn’t skip and that should help the battery life too. It’ll hold up to 1,000 songs or 25,000 photos (4GB version) and it comes in black or white. The more I look the more I like. My question is how small can they keep them this size but still get them up to 80 (or 100) GB? I’m sorry that I’m such an Apple geek, I just think they make really stuff (I’m not really sorry). And with the iPods everyone (even Windows people) can benefit from it. I’m sure these work as external storage devices too. Photo/diagram in the extended entry. In addition, from the iPod it deleted 6GB of podcasts and says it can’t sync (error -39) but no suggestions on recovering. I adding a gajillion podcasts back in. Added my photos and I seem to be a-okay (so far). So I’ve seen many complaints on-line that they’ve never released harry Potter as an eBook, I’m not sure if they’ve every released it as a downloadable Audio Book (I’m thinking no). So the iTunes store has released the books are Audio Book and you can get the complete set for $249. Or you can get a specially engraved 20GB iPod with with the Hogwarts Crest and all the audio books for $549. A little pricey if you ask me, I’m assuming you can by the Audio Books on CD for about the same price (and still have a backup). So I’ve been getting some promos from Talk America for their DSL which is only $25 a month (first month free and free modem) and they claim 4MB service. They also offer free dial-up for travel (but the guy on the phone referred to is as a backup plan). I love Talk America. I use them for my phone service: my local calling area is much larger (most of metro Detroit), unlimited minutes and unlimited member to member calling for 22.95. I thought I’d try it, it’s free, right? But the computer at their end was dead so I have to wait. But then I called my cable company (Comcast) and hassled them (generally it’s best to call the disconnect / cancel service departments for these calls. I got them to drop my cable modem costs $10 a month (for the next 12 months) with no problem. A little more haggling and I got them down $15 a month, so I’m not as cheap as the DSL but I’m definitely in the range of where I want to be and it’s been good service so I’m happy with it (I did this about 8 months ago and they gave me a similar, but not as good as this, discount for six months). Back to Talk phone service: Call Waiting, Repeat Dialing, Speed Calling 8, 3-Way Calling, Call Return and Caller ID are $5.00 more a month for all (not each). Statewide or Nationwide unlimited calling are $12 or $18. And I don’t know what they charge now (but it used to be cheap) for a second number, same line just a second number than rings differently (so if it’s not for you you don’t bother to get it! ), this is always a cool feature to have especially with roommates or kids. I’m not selling this I just think it’s a good deal for people with land lines. 10 years ago – I lived in Haslett (east of East Lansing), I still worked at the Department of Education for the State of Michigan. I really miss both, I loved the job (I left because my boss left and I went to work for him at another job) and I really miss the Lansing area. I definitely miss the (lack of) traffic and (lack of) construction that we have in the Detroit area. I miss my little apartment too, I was right next door to a 24 hour Quality Dairy (w/laundramat) so I could get ice cream, donuts, milk, do laundry, get lottery tickets and use an ATM any time of the day or night. And I was right by Lake Lansing, I could put in all my laundry (not just one load) and go sit at the park by they lake or rollerblade around the lake… Did I say I missed living there?!? 5 years ago – I’m thinking I was sick. I only remember because it was the year I bought my condo (in October) and I remember being so very sick that September with (I don’t even remember exactly) some kind of lung infection. I had moved back to the Detroit area the year before and I don’t remember much else. 1 years ago – I don’t have a clue what I was up to last year at this time (same job, same home, same stuff). I don’t even remember what I did for labor day (I hope that’s not insulting to anyone). 1 day ago – After all the chaos of starting up the school year, I had a nice quiet day at work (we were closed so no one was around) and got to catch up. In the evening I hung out with a bunch of my high school friends (some were in town for a reunion, so we all got together). Always great fun to see all of them! I was very excited when I looked at the Sunday funnies today, Calvin and Hobbes was right there with a big color strip above the fold! It was a pretty generic entry, it had today’s date on it but with a little surfing I found out it’s reruns. 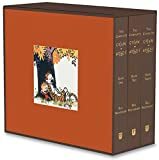 There never was an officially licensed Hobbes, nor was there any genuine “Calvin and Hobbes” product other than the strips or the books in which they’re collected. When they say they are evacuating a city I always assumed (uh oh) that meant they were doing something to get people out. Not just telling them to leave. To me, evacuation means busses and trucks to get people out and (probably) a destination to go to. Am I wrong? Have I watched to many movies? It’s sad, but I was excited last night to only pay $2.99 for a gallon of gasoline. Yahoo! is still offering domain name registration for only $2 $4.98. I thought this was a one day only deal so if you didn’t get it when I mentioned it yesterday. So if you’ve ever wanted to be http://www.yournamehere.com/, now’s the time!!! UPDATE: Sorry, The price just went up to $4.98. Even if you aren’t going to use it this month/year. This 5 year registration is cheaper than a 2 year registration at most places and this stops someone else from getting it instead of you. So even if you’re not going to use it for 3 years, you’re still ahead of the game. For a confirmed donation of $50 to the American Red Cross, I’ll write a 600 word essay on the subject of your choice, with a minimum of two references. I’m sure this is a limited time offer (and void where prohibited). So I never got around to saying much about the Tori Amos concert the other night. I ended up getting great tickets, they freed some up a few hours before the show, so I ended up getting in the orchestra section a little on the right (row 4) so it was great. Totally different concert from when she was here in the spring, she played lots of old stuff then and (unfortunately) very little old stuff here. One of the cooler songs she played was a excellent mix of God and Running Up That Hill, the latter being a Kate Bush song. She also played Starry, Starry Night I have heard her play before and I like it. A few other covers too, but I didn’t know them (I suppose they could have been a new song that I didn’t recognize). (I’m back, I just googled a set list) So here’s what she played, I would have guessed there were more songs, I thought she played close to two hours (at least 90 min). Three times a year (by law) you can get a Free Credit Report ; that’s once each from each of the credit report companies (Equifax, Transunion and Experian). They’ve been rolling this out by different parts of the country, today marks the day when now the whole country hass free access. I posted a virtually identical post earlier this year, but since they opened up the rest of the US and I think it’s pretty important that you check and it’s free, I felt it was worth mentioning again. I think I like the Equifax one the best, it seemed the most complete and understandable (IMHO). The first time I ever did one I had over a dozen open credit cards that should have been closed. The FTC has more info on-line. There is two ways to do this, get all three at once if you really want to clear things up, or get one every four months to keep an eye on it. Be sure to print it out when you get it, it’s really hard to see the 10+ page report on the display. They will ask you personal information to determine if you are really you, this includes: SS number, mortgage and loan companies, monthly payments, past addresses, etc. But they do much of it as multiple choice questions (and some answers are ‘none of the above’). A charge card number is NOT required to get the free report. There is no catch but they will try to sell you your score (or other services). But if you’ve got wrong info on your report who cares what your score is? Clear up the problems, close the cards you don’t use and get the score the next time around. If you close a few of your cards you can write to all of the companies (Equifax, Transunion and Experian) to close them (and ask that they send you a corrected report they might just send you one for free). Then see how clear the other ones looks the next time around. Do NOT close your oldest cards even if you don’t use them, it’s good to have a long credit history. Yahoo! is offering domain name registration for only $2.00 for today only. It looks like you can register it for up to 5 years! This is an incredible deal, most offers like this do not allow you to register for more than one year! This is SO cheap for this type of thing, it’s basically free. Ten years ago registrations were $50 a year (minimum two year registration). http://GarySaid.com/2005/09/ generated Tuesday, April 23rd 2019 at 12:40:45 pm EDT (in 256 queries in 0.944 seconds).